The word "creme" can be misleading. In reality, stencil cremes are not creamy, but have the consistency of lipstick. Stencil cremes dry more slowly than acrylics, making them a wonderful choice if you want to blend several colors while stenciling. Stencil cremes, if not heavily applied, take approximately 24 hours to dry to the touch and about one to two weeks to totally cure. Clean up is a bit more difficult than acrylics most brushes clean up with soap and water; we find that Dawn dish washing liquid works best. Occasionally a more thorough cleaning is necessary - mineral spirits or overnight soaking in Simple Green. A tough, thick layer forms on the surface of stencil cremes, causing one to believe the paint has dried out and is not longer useable, but this is not true. Simply remove this skin using a paper towel or toothpick. Insert the toothpick near the outside edge of the creme, lifting upwards until you can grip it with your fingers and peel off. After you have removed this rubbery layer, dab your brush into the paint. Using circular motions, remove excess on a paper towel. This circular motion also distributes the paint evenly throughout the bristles. Your brush is now ready for stenciling. 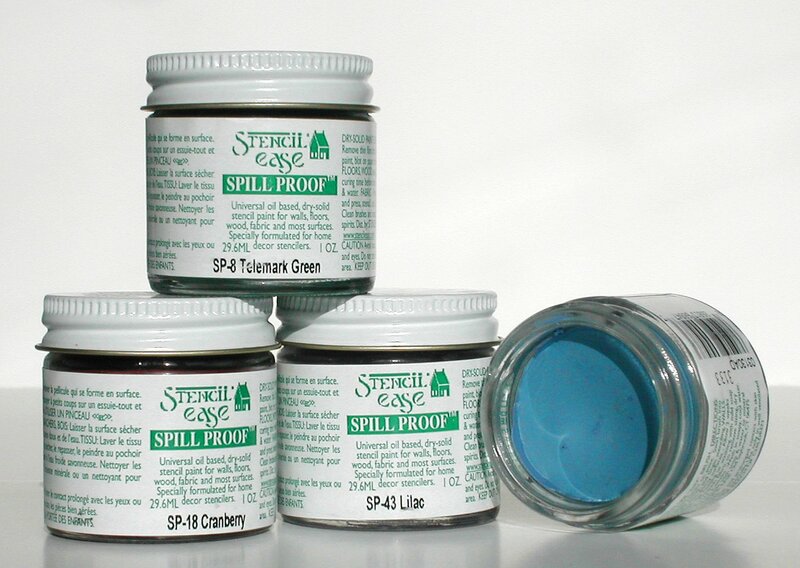 Stencil cremes can be used for painting on walls, fabric, sealed wood or paper. Note: Several customers using stencil cremes have written asking why their stenciled designs are not drying. In these cases, it is likely the stencil cremes were heavily applied or the stenciled surfaces were high gloss or non-porous. In the event that your cremes are not drying, you can apply a light mist of Delta Top Coat or Stencil Magic Top Coat to the stenciled area. This will protect the stenciled design from smudging while it is drying. Please read the top coat instructions before spraying your surface.